As a "novice" dancing mum I remember well the sitting on the bleachers asking Dad to tape the older dancers so my little dancer could have a visual example of what she was "supposed" to look like. One afternoon a dancer with flashing dark eyes and black hair made the audience around me gasp with her leaps and hi cutting. That dancer was Kitty Hart, who from the age of 5 started her very successful dancing career, championships came fast and furious, extensive ballet training with the Minnesota Dance Theatre for 10 years certainly helped her career. "I definitely promote ballet for the Highland dancer, it gives a structure for the dancers, helps them feel the movement and strengthens the muscles needed for Highland." Kitty counted herself fortunate in having a "dancing family" Florence Hart, Kitty's mum, herself a competitive dancer in her youth in Scotland and medal winner at Cowal, teacher and SOBHD adjudicator was there to help her daughter, as was brother Andrew a piper who helped with the musical side of her practices. Not to be forgotten, Dad, originally from Holland, seeing his daughter dancing the Sword dance over yardsticks with spools of thread underneath to make them a few inches off the floor, went into the basement and after a few hours of labour came up with practice swords for his daughter. Little did he realize that in the years to follow that dancers all over the country would be using his swords to dance over and around in competitions and studios. Kitty spent every summer in Scotland dancing at the competitions, such as Braemar, Cowal, British Open, Overseas, and Commonwealth. It was the World Championships at Cowal, however where she was 2nd runner-up that was her favorite. "There is such an intense energy level in the air, the excitement of so many competitors, and pure energy that fills the place with everyone wanting to do their best to try to win!" Kitty, now an adjudicator with the SOBHD, was approached by a parent asking if they could video a lesson so that their dancer would have something to use as a guide when their dancer was practicing at home. " I had purchased a couple of the Irish practice videos, and thought the same could be done with Highland, although the Highland instructional/practice video is geared to the Highland participant" Thanks to brother Andrew and his help filming first video took place." 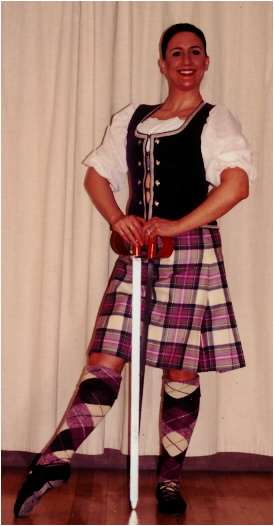 two days of 10 hours of filming, the narration, the retakes, the weeks of editing the 10 tapes to one eventually produced "Highland Kitty's Scottish Dancing for the beginner/novice" video. The video starts with stretching and ballet warm-ups, continues with the basic technical positions and movements used for the Highland Fling, Sword dance and Seann Tribhaus, and finishes with a complete run-though of each dance with live piper, Andrew Hart.
" I hope that this video will stimulate the dancer to practice correctly. Dancing is very visual and the use of the video might help stimulate the dancer when practicing as well as showing the dancer and the parents to understand how the they get to certain things and what they are supposed to look like. If I can help any little dancer have some guidance at home on what to go through for a basic practice I will be thrilled!" "Highland Kitty's Scottish Dancing" video has been given A+ by teachers and adjudicators who have seen the video and the favourable comments from the highland dancing world prompted this writer to ask if Kitty has plans for a series of videos. "Making this video was very expensive, and if I break even I am certainly considering other videos. I am considering one with the National dances, or perhaps the Jig and Hornpipe. I have been asked to also do a training video, strengthening exercises and fitness training for the Premier dancer with the advanced Highland steps. I have noticed that the dancers who helped with the video and have used their preview copies to practice have definitely shown improvement." Although brother Andrew was instrumental in the making of the first video Kitty hopes that mum, Florence will be on hand for the next endeavor. " My mother was out of the country during the filming etc of this first one, and I hope that I can add her expertise to the production of any further releases"
Indeed, Florence Hart is also no stranger to the performing arts as not only was she a top Highland dancer in her youth but also pursued a career in theatre on the stages of Glasgow and London, singing and of course dancing. The hours that dancers need to practice at home in the world of competitive Highland would certainly have been made easier for this writer had I had the visual aid in order to help my dancer. I am sure that mums and dads worldwide will thank Kitty for all her hard work and look forward to the next in the series. 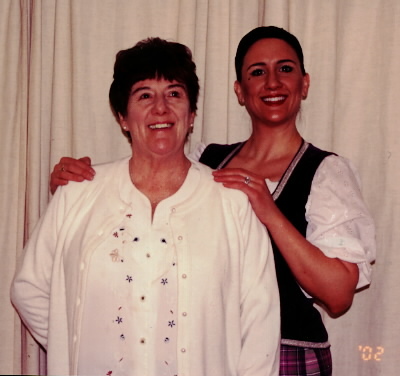 You may purchase "Highland Kitty's Scottish Dancing" video through Kitty Hart Stoker at www.highlandkitty@hotmail.com, www.highlandkitty.com web page, or 612-926-HART. Other vendors are, Highland X Press at www.highlandxpress@aol.com or 816-746-6750. In Canada, Winnie's Workshop at winnieliddell@sympatico.ca or 416-620-0703.